Cladding is a bonding process involving two different types of metals. Unlike gluing or welding metals together, cladding is not used primarily as a fastening method. Rather, it is used to for a variety of purposes. For example, laser cladding, which is one of several forms of metal cladding, is often used to coat and repair mechanical parts. Metal cladding is also used to minimize the amount of expensive or scarce metals used in the production of parts or coins; in this application, a cheaper metal is used as a filler while the more expensive metal is clad around it. Several types of cladding processes exist including roll welding, explosive welding, and laser cladding. Roll weld cladding – With roll weld cladding, two different types of metal layers move through rollers under pressure. The pressure and movement press and bond the metal layers together. Explosive welding – With this technique, a sheet of explosive chemicals is detonated between two sheets of metal. Laser cladding – Laser cladding uses a laser beam to melt a metallic powder onto a substrate. With laser cladding, precise patterns can be created. What is Laser Cladding Used for? Because of its precision and ability to coat virtually any shape, laser cladding has a variety of applications. It is commonly used to apply anti-corrosion layers and wear-resistant coatings to mechanical parts such as turbine blades, drill bits, and engine parts. 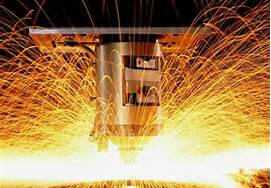 Laser cladding is also used to repair worn or poorly made components as well as manufacture three dimensional parts. Laser cladding requires a diode, CO2, or Nd:YAG laser system designed for cladding. These systems include robotic arms which move according to the data input into the system’s CAD/CAM software. Several different means (such as metal wires, metallic powders, and injection nozzles) are used to create what’s known as a “melt pool.” The laser interacts with the metal wire or powder, causing it to melt. From there, the melt pool is deposited onto a metal substrate, often by moving the substrate beneath the laser. Alternately, the laser itself may move over the substrate. The CAD software guides the movement, resulting in precise metal tracks and cladding. Whether you need to manufacture metal parts or repair worn ones, laser cladding could be an excellent choice. Laser coatings can extend the life of moving mechanical parts dramatically. As parts become nicked, scratched, or worn, laser cladding can quickly restore them which further extends their useful life. Article Source: BaseArticles by Author Mark Williams .